Troop 50 made its annual pilgrimage to the cold heights of the Smokey Mountains for a weekend of fun and fellowship mixed with skiing and tubing at Ober Gatlinburg. This trip marks the third year that the troop has enjoyed these activities during the Martin Luther King, Jr. holiday weekend. We departed Auburn on Friday evening and after a dinner stop at our favorite Wendy's restaurant in Cartersville, Georgia, we continued our northward journey into the mountains of Tennessee, arriving in Gatlinburg around 1:00 AM. A few hardy souls still roamed the streets of town, although some of them appeared the worse for wear. hardy enough to brave the 19 degree cold without warm coats. Arising with surprising vigor by 8:00, the scouts were soon out exploring the shops along the parkway. A number of establishments in Gatlinburg seem dedicated to the sale of various knives, swords, and other dangerous weapons. A stop in one of these stores helped to satisfy some of the curiosity and the scouts soon moved on to a spirited round of mini-golf. This was followed by lunch at the Pizza Hut in which a number of pizzas seemed to disappear as soon as they hit the tables. A few crumbs were all that remained. The afternoon began with a ride on the aerial tram up to the ski area for snow tubing. The troop was joined by several of the parents and other family members who made repeated runs down the slides while perched atop inner tubes. This is always great fun, although several scouts noted that the slides seemed much slower than last year. This surely must be due to the effects of global warming. Everett and Joe are prepared, as always, for the cold, snowy environment. ability of his fellow scouts. Following our return to downtown, we were off to dinner at our usual spot at Blaine's restaurant. In fact, we were even assigned the same waitress as last year. 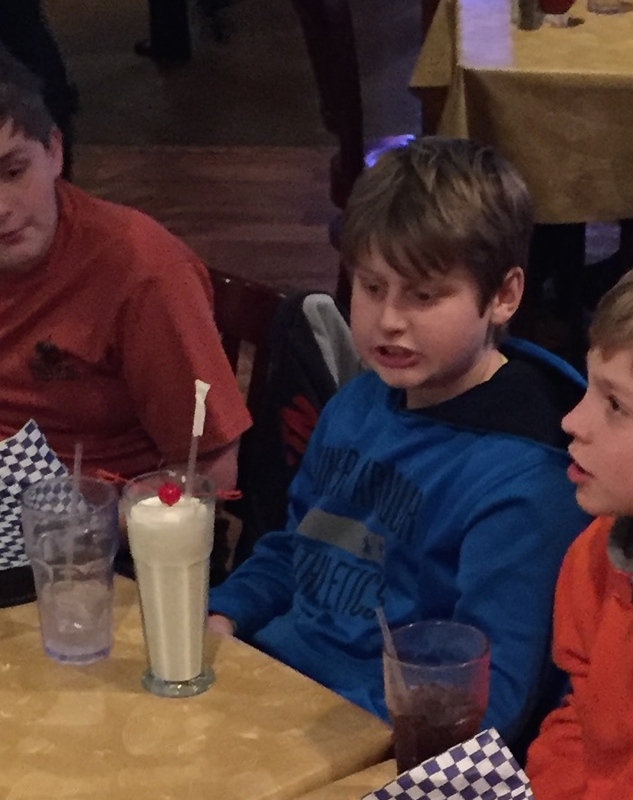 After a nice dinner, in which we were able to view the final portion of the Auburn-Kentucky game on TV, we celebrated Everett's birthday with a milkshake and a harmonious(?) rendition of "Happy Birthday" (which is, thankfully, no longer under copyright). To cap off the day, the scouts trooped into the arcade next door to the restaurant where they engaged in a number of games of chance/skill with varying degrees of success. 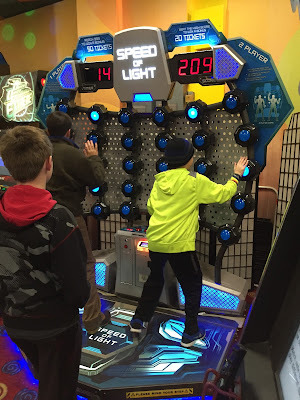 One highlight seemed to be the dubious performance skills of an assistant scoutmaster on the Guitar Hero machine. It is doubtful that any of the major hair bands have anything to worry about from his competition. Moving somewhat less than the speed of light. When we awoke on the following morning, a light dusting of snow upon the vehicles heralded the beginning of a great day for skiing. Although the majority of the snow at Ober Gatlinburg is manufactured, a mixture of natural snow and the cool temperatures gave us near perfect conditions. While the experienced scouts quickly took to the slopes upon receiving their equipment, the new-to-skiing scouts matriculated to ski school under the guidance of a couple of adult leaders. Our ski instructor, Bill, who was also a repeat from previous years, had unfortunately sworn allegiance to the other SEC university in our state and had a number of things to say about our being from Auburn. In teaching the scouts how to stop, he referred to the shape of a plow, with which he said all people from Auburn would be familiar. Bill teaches the basics of skiing using a few dubious metaphors. Miles, Carl, and Creighton prepare for a downhill run. Throughout the day, most scouts and leaders enjoyed numerous runs along the crowded slopes. Between skiing, ice skating, the scenic chair lift, and the numerous opportunities for food; everyone could find something to enjoy. Although the scoutmaster managed to avoid injury (something he has not been able to do in the past), one of the scouts twisted his knee and had to be hauled off the mountain by the ski patrol. Fortunately, it was not serious and at last report was recovering well. After a filling dinner at the Seasons of Ober restaurant, a few of the scouts and leaders headed back to the hotel, while the majority of the group stayed to enjoy the skiing after dark. The senior patrol leader and assistant SPL even tried their hand (or maybe it's feet) at snowboarding during the evening session. A hardy breakfast prior to our departure from Gatlinburg. look like they could use more coffee. After a good breakfast at the Flapjack House, we hit the road heading south. 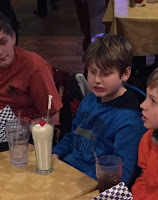 Rather than visit the go-cart track in Pigeon Forge as we have done in the past, we took one of the scout suggestions from the annual planning conference and stopped at The Lost Sea in Sweetwater, Tennessee. Craighead Caverns is home to the largest underground lake in the United States. Led by our intrepid guide, Savannah, we descended into the depths of the caverns to view the evidence of Cherokee habitation, the remains of a short-lived nightclub from the 1940s, and a cache of government supplies from a Cold War fallout shelter. After working our way to the lowest level of the cave, we boarded boats for a trip out across the water. The lake has been stocked with mountain trout since the 1960s and they are regularly fed by every tour as they traverse the lake. Following our climb back to the daylight, we were back on the road to Auburn after lunch. as we pause at the cave entrance. Ready for the boat trip on the underground lake. After a long drive, we all arrived safely back to Auburn by 5:00 PM and another great trip was logged into the history books. As an annual trip for scouts and families, Gatlinburg has been an enjoyable experience for the three years that we have been making the trip. It provides the scouts with an opportunity to challenge themselves on the ski slopes while also engaging in the fellowship of a troop outing. We look forward to more great family trips in the future. As always, many more photos are found in the online photo gallery.